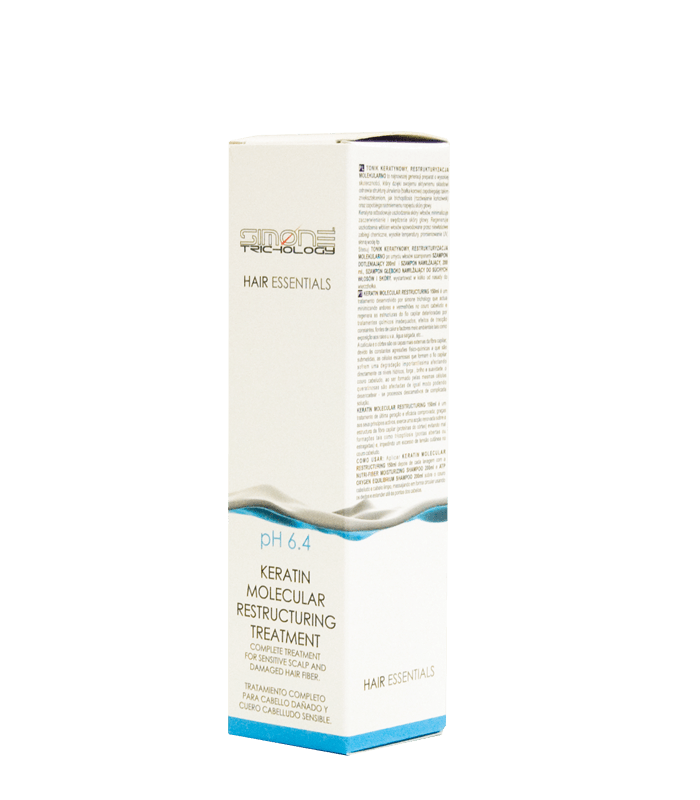 KERATIN MOLECULAR RESTRUCTURING is a treatment developed in SIMONE TRICHOLOGY for minimizing itching and redness in the scalp and, regenerates the damaged structures on the hair fiber. The cuticle and cortex, which are the most external hair layers, due the continous aggressions, suffer a physical-chemical degrading process which affects especially the scaly cells that make the cuticle, its result it is a variation of the optimal hydration, smoothness and brightness. These changes in hair strength show that cortex degradation and the scalp is also affected by possible development of unwanted scaly processes. KERATIN MOLECULAR RESTRUCTURING is last generation treatment with high effectiveness, by its active composition, renews the structure of capillary fiber (cortex proteins) avoiding malformations like trichoptilosis (split ends) and, preventing an excess of cutaneous tension on the scalp. Apply after every wash on the scalp and hair clean, massage in a circle using fingers.